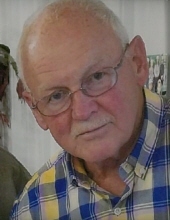 Danny Douglas Holley, 72, of Ridgeway, VA passed away on Saturday, November 24, 2018. He was born on April 30, 1946 in Danville, VA to the late Douglas Holley and Arlene A. Holley. In addition to his parents, he is preceded in death by an infant sister. Mr. Holley served in the United States Army during the Vietnam War in the 25th Infantry Division Artillery. He was a maintenance mechanic at Georgia Pacific also known as JJ Southeast where he later retired from after forty six years. He was a member of the VFW Post #4637 and was of the Baptist Faith. He is survived by his wife of fifty years, Sandra Holley; two daughters, Marsha Nance and husband Reuben, and Ashley Bender; three sisters, Joyce H. Harris, Ginger Edwards, and Darlene Moore. He is also survived by five grandchildren, Dakota Bender, Carson Bender, Raylan Bender, Zoe Nance, and Tyler Nance. In Lieu of flowers, memorials may be made to the Veterans Honor Guard, P.O. Box 1002 Collinsville, VA 24112 or St. Jude Children’s Research Hospital Tribute Program, P.O. Box 1000, Dept. 142, Memphis, TN 38101. Visitation will be held from 1:00 p.m. to 2:00 p.m. on Tuesday, November 27, 2018 at Norris Funeral Services, Martinsville Chapel. Graveside service will be held at Roselawn Burial Park at 2:00 p.m. on Tuesday, November 27, 2018 with Pastor Doug Ramsey officiating. Military Rites performed by the Martinsville-Henry County Honor Guard. Norris Funeral Services, Inc. and Crematory of Martinsville, VA is serving the Holley family. To send flowers or a remembrance gift to the family of Danny Douglas Holley, please visit our Tribute Store. "Email Address" would like to share the life celebration of Danny Douglas Holley. Click on the "link" to go to share a favorite memory or leave a condolence message for the family.